Here's your chance to get that perfect pair of jeans you always wished for. 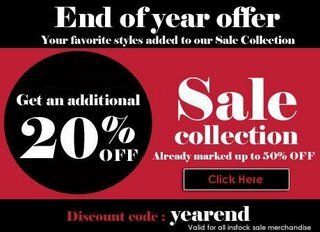 With hundreds of styles added to the End of Year Sale ollection, it's never been easier. Get an additional 20% on sale collection which has already been discounted by up to 50%. At checkout simply use discount code: yearend. This offer is valid for all instock sale merchandise and ends on January 2, 2007. FREE 1st Exchange with the product of your choice.